Written in 2013, updated in 2017. The first time I visited Kawagoe Sports park (川越運動公園）I wasn’t all that enamored with it. From the point of view of a parent, there is little to entertain older children and it is most suited to a small child. However, they have recently upgraded the playground and so I have upgraded the park from a 2 star rating to a 3 star rating! Toddlers and preschoolers will enjoy this colourful playground. The main combination unit of the playground has three slides. One is a tunnel windy one and two are bumpy ones. There is also a climbing net, a climbing wall and stairs. There is a smaller combination unit for toddlers. 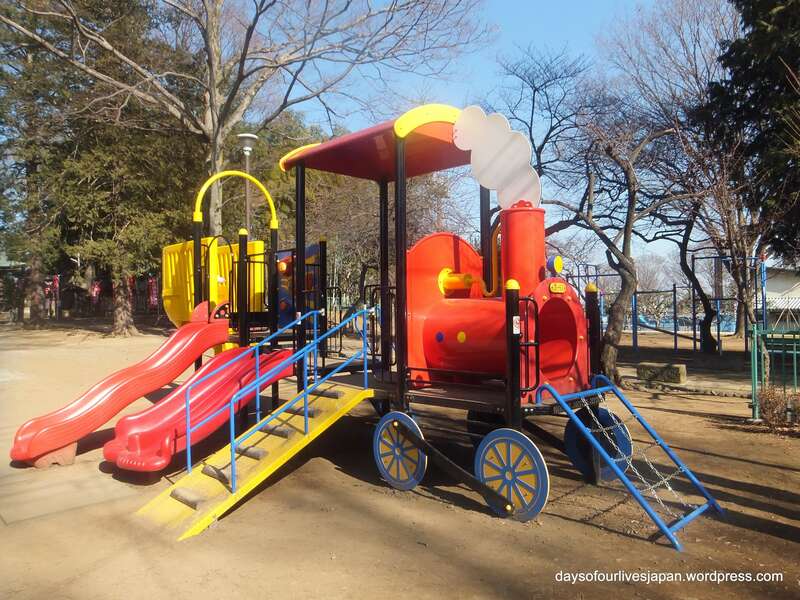 It has some small climbing activities and two colourful slides. There is a giraffe statue in the centre. There is climbing net activity for all ages beside it with fish statues on the top of the poles that support the nets. On the right of the playground is a flying fox type activity. There is another play area right beside this playground, but they are separated by fencing. It is where the sandpit and spring rides are. There are also some fun audio aural play equipment in the sand pit area. The park is officially a sports park. It is home to a sports hall with a number of facilities. There is also an athletic track in the park. There are plenty of benches and seats in the park and some picnic tables too. The park boasts a mini bell tower, a symbol of Kawagoe. There are some cherry blossom trees in the park. In the summer they have a very small wading river. The official hours of the park are 9 am to 9 pm. Parking is free and abundant. However, when there is a big sports event on you may have to use one of the overflow car parks which are a bit of a walk away. There is a bus terminus there, one of the buses goes to Kawagoe station. There are toilets and vending machines.